Welcome to 7-Imp’s 7 Kicks, a weekly meeting ground for taking some time to reflect on Seven(ish) Exceptionally Fabulous, Beautiful, Interesting, Hilarious, or Otherwise Positive Noteworthy Things from the past week, whether book-related or not, that happened to you. As I type this, I’m getting ready to head to Knoxville, Tennessee, for this wonderful conference, so I’m going to keep things short and simple (ahem, short for me, that is) this week. I’ve got things to pack and CDs to pile up in my car for my road trip. (Have bluegrass, can travel.) However, I do hope folks will leave their kicks, as I’ll be back and reading them by Sunday. Now, normally the first Sunday of each month, I share the work of a student or brand-spankin’-new-to-the-field illustrator, but I’m going to shake things up and do that next week instead. I didn’t want to slight a shiny new illustrator today, since I’m mostly on my way out the door. Instead, I’m pleased to be showing you spreads this morning from Yukiko Kato’s In the Meadow, illustrated by Komako Sakai. I’m a fan of Sakai’s work. I know I’ve not seen everything she’s done and want to correct that. I love Emily’s Balloon (2006) and The Snow Day (2009), though I haven’t seen this one yet (2010). Evidently, she’s super popular in Japan (her home), and I’m happy some of her titles have made it here to the States. 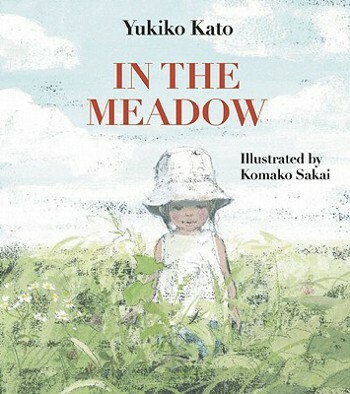 This June, Enchanted Lion Books will release this First American Edition of In the Meadow, originally published as Kusahara (The Meadow) in Japan in 2008, the story of a young girl, visiting the river with her family, who gets lost—in more ways than one—in nature. 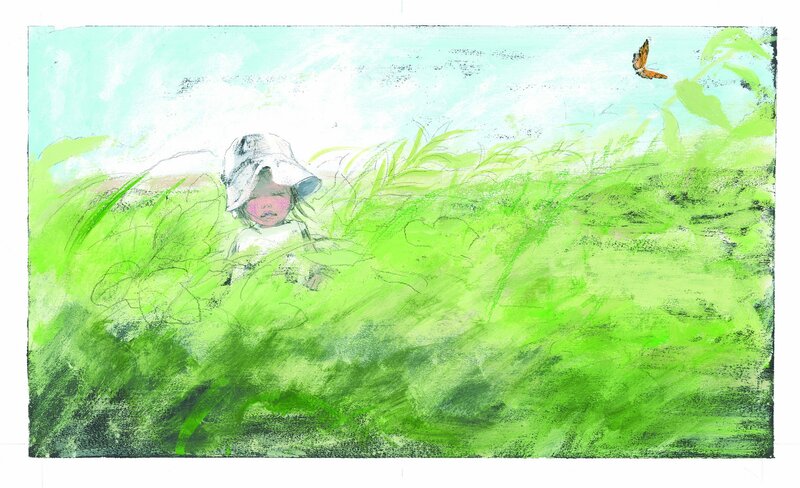 The story and illustrations so lyrically capture a young child’s beguiling, yet frightful, experience of having wandered a bit too far from the parents and of having arrived knee-deep into the swaying grasses of a meadow. Taking the child’s point-of-view, Kato writes with an immediacy that draws in the reader and gives us an array of sensual delights — what the girl sees, smells, touches, and hears: “I push my way through flowers and leaves. They smell like toothpaste, minty and sweet. The butterfly flitters and flutters over the meadow. Wait, wait, butterfly!” It is chasing this butterfly that leads her deep into the meadow, far from her family. She may end up experiencing loneliness and a bit of fear, but the trip was worth it — and her mother was never far behind, it turns out. 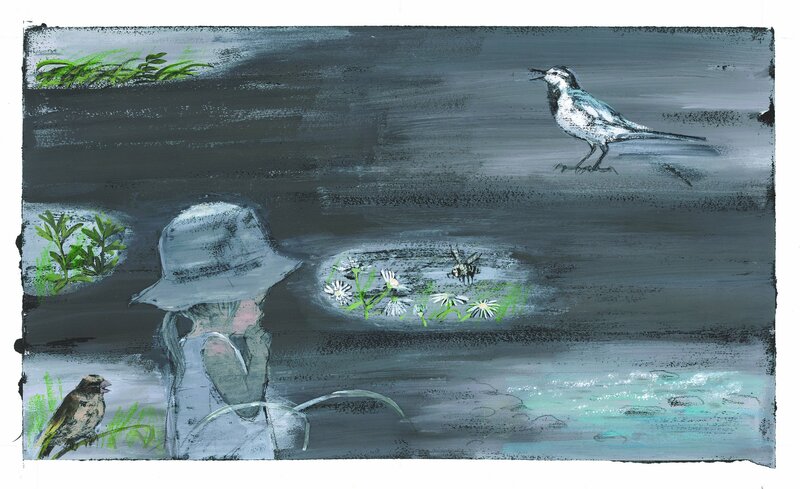 Sakai’s spreads (rendered in acrylic paints and oil pencils) cover every inch of the pages, inviting us into the little girl’s lush, green world. Her work to me has always been reminiscent of Marie Hall Ets: Both women create illustrations that capture emotions so well and are intimate and honest. Sakai knows exactly how to direct our focus to the emotional core of the tales with her color choices, perspective, and line. She places us right in the center of all the action, as if we’re traveling with the young girl. Kirkus once wrote about Sakai’s work that it appears simple yet is incredibly sophisticated. This is true. Here are more spreads from the book, since the art speaks volumes and speaks better than I. (That should be my 7-Imp slogan.) Enjoy. “I’ve come to the river with my mom and my dad and my brother to play. Susurrus, susurrus. The running river is singing a song. ‘Come, Yu-chan,’ calls my dad. IN THE MEADOW. Text copyright © 2008 by Yukiko Kato. 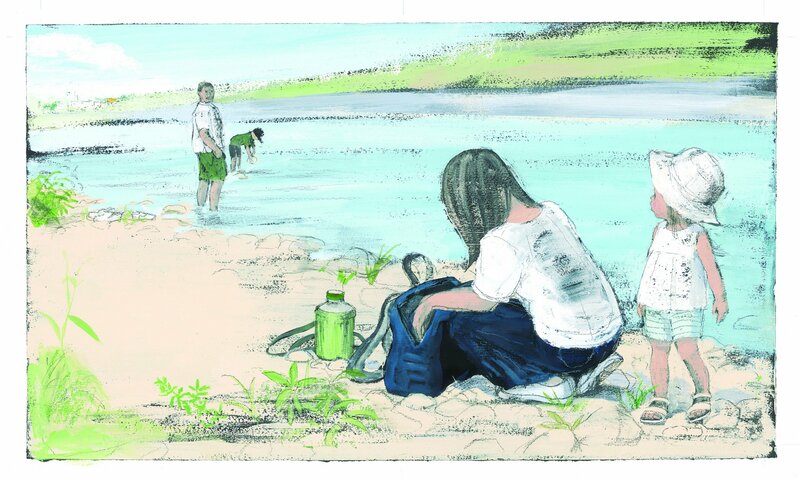 Illustrations copyright © 2008 by Komako Sakai. First American Edition © 2011. Reproduced by permission of the publisher, Enchanted Lion Books, Brooklyn, NY. 1). This audio slideshow (with British picture book author/illustrator Anthony Browne speaking) is such a lovely tribute to picture books that I whooped aloud after seeing it. The artwork on display in the slideshow is from the illustrators that Booktrust chose for their Best New Illustrators Award 2011 (British award). Good choices, I say. 3). I love this drawing so much. There are no words. That’s from illustrator Amy June Bates. You can click on her image there and super-size it to see it in more detail. 4). If you haven’t already heard about James Kennedy’s 90-Second Newbery Film Festival, why, go read! You have till September, if you’d like to play along. 5). Speaking of playing along, thanks to all who contributed to this 7-Imp challenge this week. There’s still time to play, if you’d like. People were supposed to vote for their favorites by 3PM on Thursday, but clearly my rambly directions made little sense. (Now you see what my children suffer, I suppose.) I will somehow pick a winner early this week and promise to announce results then. Sorry I’m generally disorganized, but I really do appreciate everyone who came and celebrated handlebar moustaches with us. 6). I am crazy in love with this. And my response to the imposter syndrome thingy he discusses is: a) Who knew it’s a real phenomenon? and b) I really needed to read that. Okay, off to talk about children’s lit with many, many smart folks. What are YOUR kicks this week? Through the sensitive cells in their skin. I want to be grass, and I want to be green. One owns up to a loss, and earns any win. And it must―that’s the path that it’s on. I am the gulf that no girders will span. From the shell, from the cell, I will run. That once it starts up, is never outdone. I am the seed, and I weave what I mean. I love Komako Sakai, too!! I haven’t seen this book yet, though. Usually I don’t get to enjoy the words with her books, since my brain has yet to wrap itself around the Japanese language, but I like the story she tells without words. 4. she is currently illustrating a serialized novel in the newspaper- (a la Dickens/ Cruikshank) I found my spinach from the vegetable man wrapped in chapter three yesterday. Thanks for your kicks, Jules, I’m jealous you get to go talk to grown-ups! Have fun! In the Meadow = Awww! 1. There was a workshop for children’s fiction yesterday – for new writers – and I was on the panel of critics for the manuscripts. It’s amazing reading the work of and meeting the future children’s book authors of the Philippines. 2. My cousin just graduated from college and our family celebrated last night. I love being with all my cousins! And there was even a roast pig! Steven, I really like that poem and, like Amy, love the last two lines. And how ’bout those Smoky Mts.? Amy, thank you for sharing those images and book covers. I think I literally gasped at one. DANG, I really want to see everything she’s ever done. Lucky you, over in Japan, getting your spinach wrapped and then getting a Sakai surprise. And I loved your long comment. No apologies necessary. Tarie: CONGRATS on the panel! They recognize real talent when they see it. Also, I love reading about your big family and the things you eat. Greetings, Komako Sakai! Thanks for sharing your artwork with us. I like the chirping bird. Jules: Have a safe and wonderful trip! Thanks for sharing Amy June Bates’ spy paper doll. That is awesome. Amy: Nice to meet you. I love the spy paper doll. I’ve always loved espionage stories and wished I could work undercover. I suppose that I do work undercover, actually, since I’m an actress. I’m not a ninja, but perhaps I’ll play one on TV someday. Steven: Thanks, as always, for sharing your poetry. Tarie: Congratulations to your cousin, and congratulations on your being a panelist! 4. Offered the role this morning! Little Willow, glad to see you’re feeling well! Congrats on the role! Thanks, Jules! How goes the event? 1. horse came back this spring for riding 🙂 bathed yesterday, will clip today. he was not nearly as happy about this as I was. 2. got friended by someone from Iran on FB. not a scammer. kinda neat. 3. updated blog post from my friend in Tanzania. The conference was great, Little Willow. Invigorating. Christy, do not be ‘afeared of 7-Imp or me! Glad you visited. What part of the country do you live in? Your site looks great. Will explore further (and maybe get the answer to my question there). And I’ve never heard of putting chocolate and zucchini together. Mmm. Ooh – that book looks marvelous! Hi Jules, glad good conference. Love the imposter syndrome link (similar reaction). Tarie – your family celebrations sound magical and joyous and fun! Hi LW! Congrats on the work! Missed you! Steven – the second stanza of your poem grabs me. 1) Ran a 5K this a.m. and came in 10th place in my age division. Was feeling a tad old, so it was a nice surprise and pick me up. Oh boy, do I have a chocolate zucchini cake recipe for YOU. You need big garden zucchinis though; if you try to do it with those skinny little things the grocery stores sell you’ll need like six of them LOL. I currently reside in Saskatoon, Saskatchewan, Canuckistan (erm, Canada). Which is why we still have a foot of snow and everyone’s slightly crabby about it. I had some work to do today and was quite delightfully distracted for, oh, about two hours by your site. That’s why I’m normally a bit scared to visit – it’s generally good for at least an hour of diversion and a new must-have book on the purchase list. Sigh. But thank you! Rachel, congrats on the 5K! Sorry that the site ate your original response. I hate it when that happens. I try to remember to copy and paste before I hit ‘send,’ but do I always remember? Nope. Christy, I’ll come knockin’ on your cyber-door when we grow zucchinis, which my husband wants to do this year. … Hope you get some sun soon.